You start from the parking place and Breginj and proceed right on the road. The road first climbs through the village. Soon the tarmac road ends and the gravel road brings you past a renewed sawmill to a crossroad, where you take the right fork. You soon reach a marked crossroad and follow the markings for Muzec (left fork). The path takes you past a small spring, then bends to the left and starts climbing to the next crossroads where you take the right. The path climbs through the woods onto a rocky ridge and then back into the woods. You leave the woods and take a left at the crossroads. The path follows a steep ridge. You reach a crossroads and take the left less steep fork (the right fork takes you directly to the peak). The path climbs and brings you on the main ridge of the hill. You arrive at the top in 15 minutes. Stol is the highest peak in the longest ridge of the Julian Alps (35 km long). 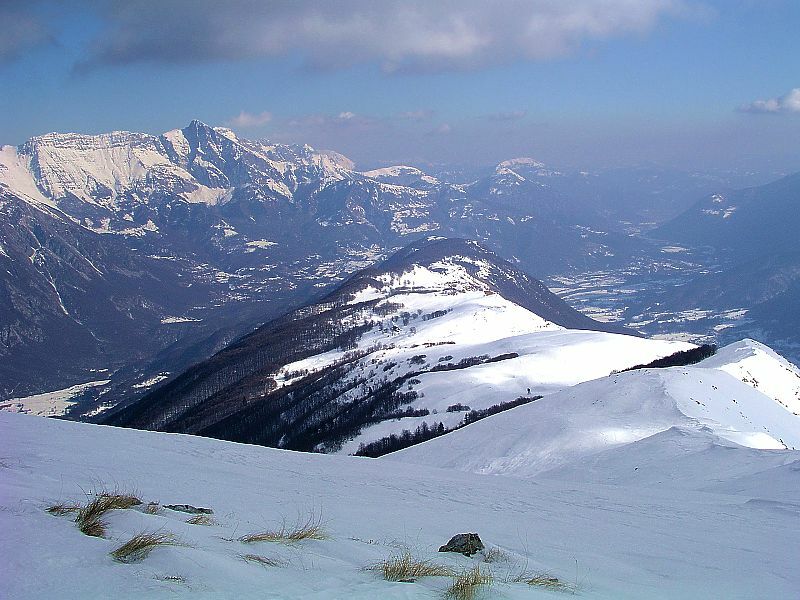 The top offers a great view on Kanin, Krn, Matajur, Breginjski kot and the Adriatic. You start from the parking place Breginj and proceed right on the road. The road first climbs through the village. Soon the tarmac road ends and the gravel road brings you past a renewed sawmill to a crossroads, where you take the right fork. The road brings you to another crossroads where you take a right fork in direction Stol. After a couple of minutes you leave the gravel road and follow a marked hiking path until you reach the church of Saint Marjeta (973 m). From there you follow the path through the woods onto meadows. The path then turns and follows a small ridge. This part of the path offers great vistas. The path ascents higher past some slippery slopes to the main ridge. On the ridge you travel in the right direction and reach the peak of Stol in about 15 minutes. Mija is a wooded hill that towers the village of Podbela. There was an old railway on Mija used for logging. We recommend the descent through the valley Pradolina on the old smugglers path. The trip starts in Podbela. You go through the village towards Robidišče. You pass the Napoleons bridge on the Nadiža and take a left turn app. 100 meters after the bridge. You follow the gravel road for an hour and a half until you reach the crossroads. The left fork leads to the mountain pasture Spodnja Mija and a hunting lodge. You take the right fork up to the peak. For the descent you recommend going down on the Italian side. A well marked path takes you from the top of Mija to the valley of Pradolina. From the valley you return to Podbela. You start the trek in Breginj. You pass the village church and the old village center and follow markings for Stol and Muzec. Soon the tarmac road ends and the gravel road brings you past a renewed sawmill to a crossroads, where you take the right fork. The road brings you to another crossroads where you take a right fork in direction Stol. 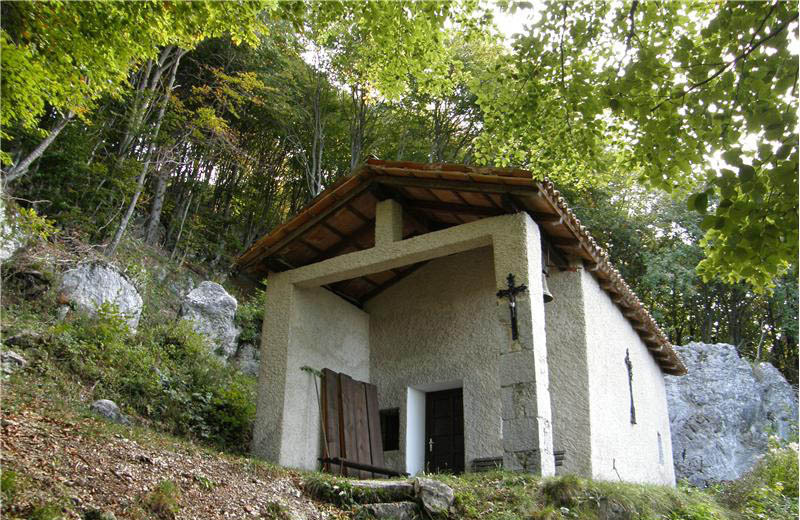 After a couple of minutes you leave the gravel road and follow a marked hiking path until you reach the church of Saint Marjeta (973 m). Trek to a small clearwater spring. You start from the parking place Breginj and proceed right on the road. The road first climbs through the village. Soon the tarmac road ends and the gravel road brings you past a renewed sawmill to a crossroads, where you take the right fork. You soon reach a marked crossroads and follow the markings for Muzec (left fork). The path takes past a small spring, then bends to the left and starts climbing to the next crossroads where you take the right. The path climbs through the woods onto a rocky ridge and then back into the woods. You leave the woods and take a right at the crossroads. The path brings you to a beautiful natural spring running from an overhanging rock wall. A very easy trip following the trail of traditional hike from Breginj to Brezje which takes place every last weekend in September. You start from the parking place in Breginj and proceed right on the road. The road first climbs through the village. Soon the tarmac road ends and the gravel road brings you past a renewed sawmill to a crossroads, where you take the right fork. You soon reach a marked crossroads and follow the markings for Muzec (left fork). The path takes you past a small spring, then bends to the left and starts climbing. The path brings you to a small crossroads where you go straight to Plazi. The Plazi area is full of springs, waterfalls and screes. You reach the WW2 memorial and follow the forest road. You follow the forest road and cross the state border. You soon cross the Black and the White stream. The path brings you to the village Brezje which was also heavily damaged in 1976 earthquake. This trip is quite difficult and is only meant for experienced hikers. First you take the path to the top of Muzec (described on top). From the top you trek westwards on the ridge. 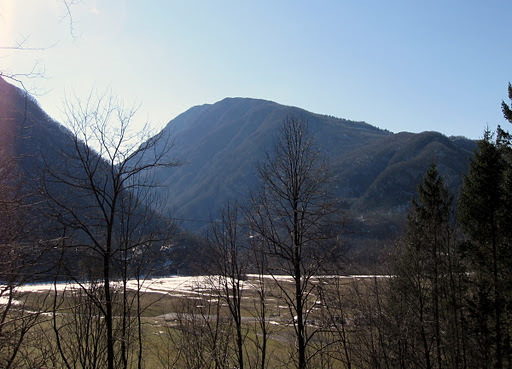 From the bivouac you follow the western ridge until you reach the peak of Gabrovec. You walk westward over some smaller peaks. After some time you reach the grassy peak Nad Ohojami. Here the path retreats from the steep ridge first on the northern wooded slope and then to the western side. This path brings you past the peak Nizki vrh to a marked crossroads. You continue on the ridge and follow markings »Br. Jalovec 1h«. The path mostly follows the ridge and brings you past the rocky cliffs Gnjilice (westernmost point of Slovenia). You follow the path west and cross a grassy ridge to reach a crossroads. Left fork leads you to village Brezje and right fork leads you to Tanamea. You continue straight ahead on the ridge. The ridge gets narrower and then ascends to the peak of Breški Jalovec. You can return through the village Brezje or double back to Nizki vrh and descend past Plazi to Breginj. Crossing the whole Stol ridge is a long and exhausting trek. Most of the path is easy; there are just some spots which require more caution. You start our trek in the village of Viškorša (Monteaperta). There is a marking for the path number 710 at the church. You follow the path which starts rising on the ridge. After some time you arrive at a hunting lodge. The path is still on the ridge which gets steeper and steeper. The path then crosses a deep ravine on the left side. Right before the bottom of the ravine the path turns back up and reaches the ridge. You continue our trek towards the east. 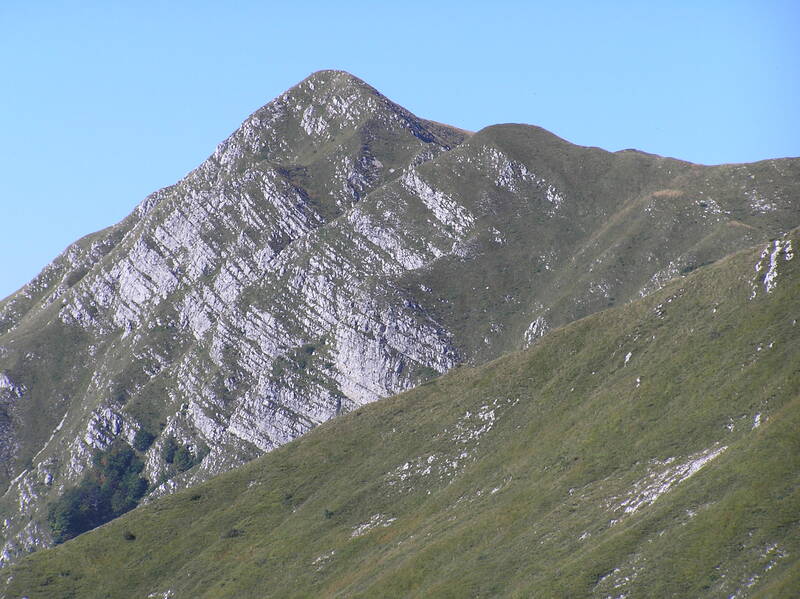 Before you reach the peak of Brinica you have to ascend and descend six smaller peaks. 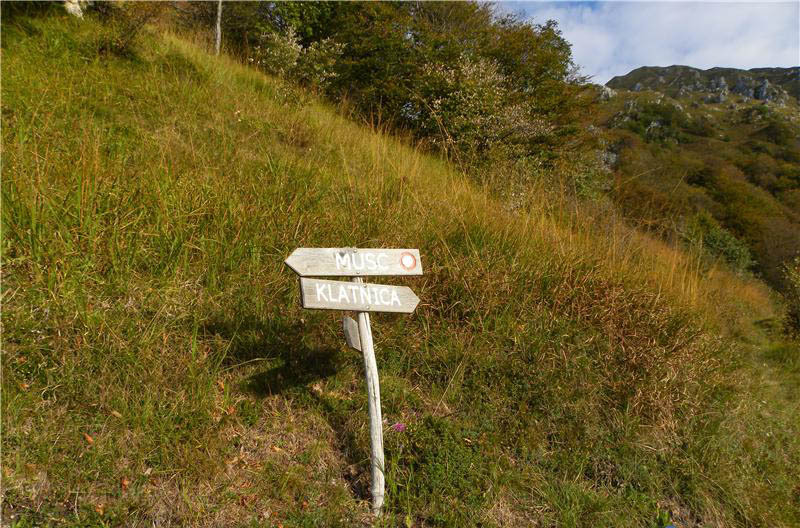 When you reach the top of Brinica our path continues to the east and descends to Križ pass. This part of the trek takes about 4 hours. From Križ pass you follow the path number 742 towards the east. 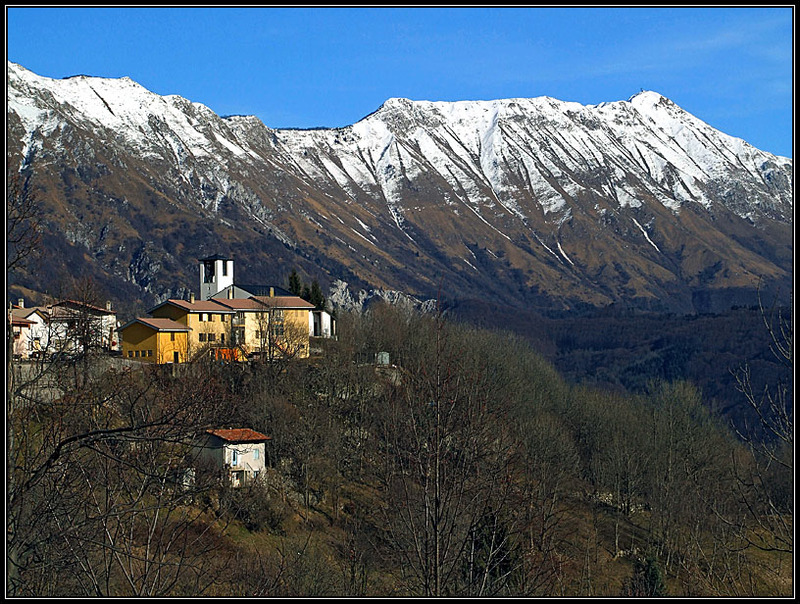 You soon come upon a cottage Montemaggiore. You can descend down to it (which takes you 15 minutes) or continue our trek on the ridge. The slopes are grassy and the ridge very wide and gives an impression of a small plateau. You pass the peak of Lanževica (Punta Lausciovizza) (1620 m). East of the peak our path is joined by a branch from the mountain cottage. This part of the trek takes about 30 minutes. You continue our eastbound trek. First you descend a little and then climb to the peak of Breški Jalovec. From the peak you continue our path northeast. Below you you see the ravine of White stream, the source of Nadiža. Our path is soon joined by two others coming from the north and south. The path takes you through a forest on the northern slope. The path then takes you on a grass covered ridge to the peak of Gnjilica. 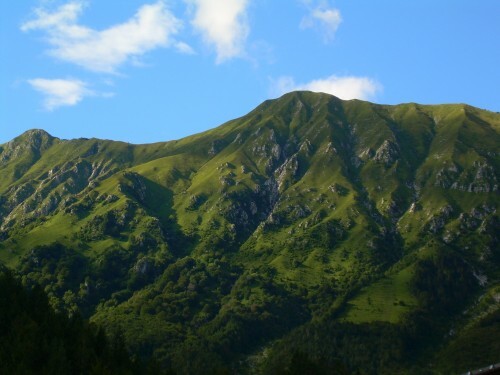 From Gnjilica you need a short trek to the peak Nizki vrh. Under the peak our path meets a path coming from Breginj. This part of the trek takes 1 hour. The ridge you follow becomes narrower. The path swerves from the grassy southern slope to the wooded northern slope. Our path passes the peaks of Nad Ohojami and Kopa. Then you ascend to the peak of Veliki Musec. From the peak you descend to the bivouac. This part of the trek takes 45 minutes. The path takes you to the peak of Musec. Then the path starts to slowly descend. You already see the peak Stol but you need to do a couple of smaller ascents and descents before you arrive on the peak. From the top you follow the path eastward and reach the jump point for paragliders. From there you follow the road to Božca mountain pasture. This part of the trek takes 2 hours and 45 minutes.